A North Carolina Pie That Elicits An 'Oh My God' Response Atlantic Beach Pie is a salty and citrusy staple of the coast. Katie Workman, author of The Mom 100 Cookbook, shared the recipe for All Things Considered's Found Recipe series. Bill Smith's Atlantic Beach Pie is based on a recipe for lemon pie, a staple of the North Carolina coast. There are days for cake, and days for ice cream and cookies. But every now and then, you crave a different kind of finish to a satisfying meal. Enter Atlantic Beach Pie, a salty and citrusy staple of the North Carolina coast. Katie Workman is the author of The Mom 100 Cookbook: 100 Recipes Every Mom Needs in Her Back Pocket. She says the Atlantic Beach Pie from Crook's Corner restaurant in Chapel Hill, N.C., is the best pie she's ever had. She shared a recipe for the dish for All Things Considered's Found Recipe series. Workman describes Crook's Corner as a "shrimp and grits, fried oysters and hush puppies kind of Southern food restaurant." She fondly remembers enjoying a particularly large spread on one visit. "We were having this amazing dinner, eating more than I think I've ever eaten in my entire life," she says. "I had no intention of eating dessert, and then he sent out this pie." 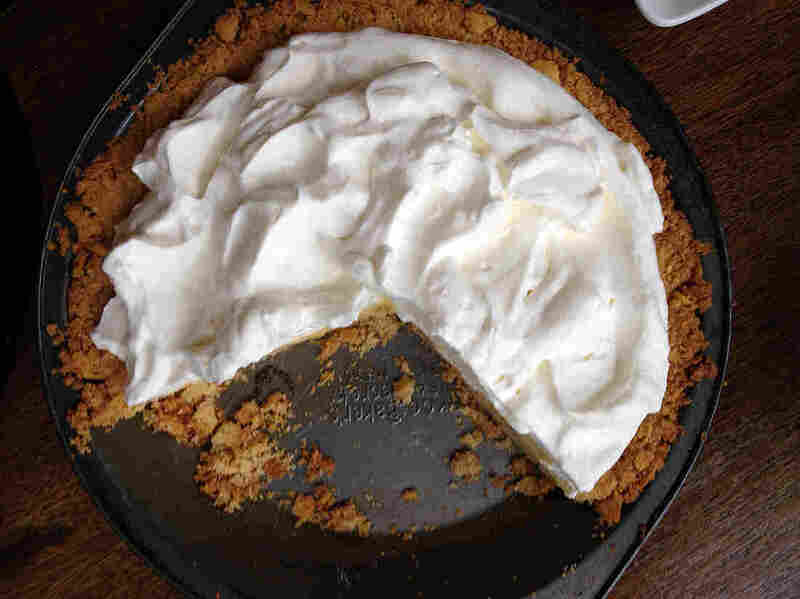 Atlantic Beach Pie has a filling similar to those in key lime and lemon meringue pies, but Workman says the crust is what makes it special. "It's this dense, crispy, thick, salty saltine crust, which is such an amazing balance to the tanginess and sweetness of the inside," she says. She was smitten at first bite and describes a When Harry Met Sally moment upon tasting. "I think the only reaction I had was, 'Oh my God, oh my God, oh my God.' For quite a while that was pretty much the only thing I could say," she says. "I think I was under control but I was in sort of a fugue state, so I can't be sure." Bill Smith, the chef at Crook's Corner, doesn't take credit for inventing the pie, which is often referred to as "lemon pie" on the North Carolina coast. In Smith's version, whipped cream replaces meringue as the topping. There's also a bit of lore that surrounds the dessert. "When we were growing up, everybody believed that ... if you ate any kind of dessert after having seafood, you would drop dead sick," he says. "The one exception was this lemon pie that all the fish restaurants along the coast served." The appeal is in the pie's simplicity. Smith jokes that it takes all of four seconds to make. In reality, it's just 18 minutes to bake the crust and 16 minutes to cook the filling. "You don't have to wait for the crust to cool," he says. "The only thing that takes any time is it has to cool enough when you're done so you can cut it without making a mess. But it couldn't be faster." This is a newer version of a pie that is commonly served at seafood restaurants on the North Carolina coast. Chef Bill Smith has been serving it at Crook's Corner and at special events for about a year. He calls it the easiest recipe in the world. Crush the crackers finely, but not to dust. You can use a food processor or your hands. Add the sugar, then knead in the butter until the crumbs hold together like dough. Press into an 8-inch pie pan. Chill for 15 minutes, then bake for 18 minutes or until the crust colors a little. While the crust is cooling (it doesn't need to be cold), beat the egg yolks into the milk, then beat in the citrus juice. It is important to completely combine these ingredients. Pour into the shell and bake for 16 minutes until the filling has set. The pie needs to be completely cold to be sliced. Serve with fresh whipped cream and a sprinkling of sea salt.